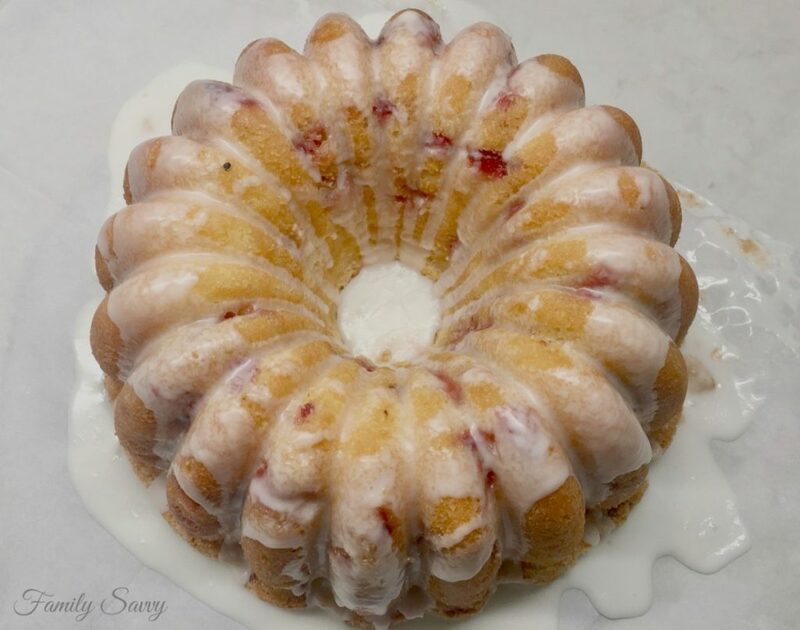 Fresh strawberry yogurt bundt cake is a sweet, moist, dense cake that is laced with strawberries and drizzled with a yummy lemon glaze. This fresh strawberry yogurt bundt cake is one of my fave desserts. It is moist, rich and delicious (no icing needed). It is easy to make ahead, freeze, and pull out for later. It will feed up to 15 folks, as a small slice will suffice for most folks. Strawberries: Fresh berries are best, but frozen will work (whole or sliced and not in syrup). Just dice berries into small pieces and drain any liquid or juice before tossing in flour (per recipe). Yogurt: Plain or vanilla work beautifully, and Greek is best. Cake Lifter: I seriously couldn’t or wouldn’t bake cakes without my cake lifter; it would be a big huge mess. 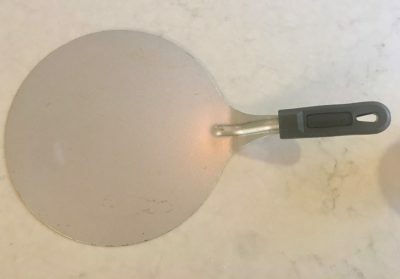 I use my cake lifter mulitple times in one baking session~here’s how. First, I turn my bundt pan upside down on top of the cake lifter so that the cake will be sitting on it when it releases from the pan. Second, I place the cake lifter (with cake on top) on a large sheet of parchment paper (enough to catch drips from glaze). Third, I glaze the cake and allow it to cool. Finally, when the cake is cooled and glazed, it easily lifts and transfers onto the cake plate~no breaks or tears. If you make this cake, I so hope you love it and would so enjoy hearing from you. As always, thanks so much for stopping by. Be blessed, and stay savvy!!! Spray large Bundt pan liberally with Baker's Joy; coat with sugar after. Sift together the 2 1/4 cups of flour, baking soda and salt. Mix in the lemon zest and set aside. With an electric mixer, cream together the butter and sugar until light and fluffy. Beat in the eggs one at a time, then stir in 1 Tb. lemon juice. Alternate beating in the flour mixture and the yogurt, mixing just until incorporated. Toss the strawberries with the remaining 1/4 cup of flour. Gently mix them into the batter. Bake for 45 minutes, or until a toothpick inserted into the center of the cake comes out clean. Allow to cool at least 20 minutes in the pan, then turn out onto a wire rack and cool completely. Once cooled, whisk together the remaining 2 Tb. of lemon juice and the powdered sugar. Hey Jamie, not sure if I ever told you this but I actually made your strawberry yogurt Bundt cake for a huge wedding cake a year ago! It was spectacular and the perfect density to hold up to the weight of the other tiers. Everyone loved it! Thanks for sharing your fabulous recipes! Hi Cathy, thanks for commenting. I corrected the temp; it was supposed to be 350F. Let me know how the cake turns out!!! Is the temp correct at 325? I’ve never cooked a cake at 325 it’s usually 350′.